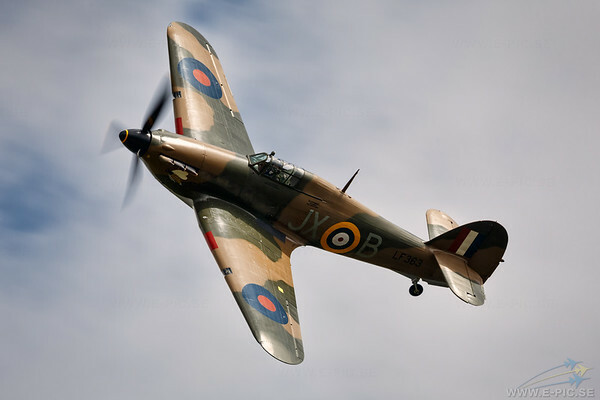 More Hurricane images here: http://www.e-pic.se/Aircraft/Aircraft-sorted-by-type/Hawker/Hawker-Hurricane/. Hurricane LF363 LF363 was then stored in the open air at Langley, waiting to be scrapped. Fortunately, it was rescued in mid-1949, largely through the intervention of Air Commodore (later Air Vice Marshal) Stanley Vincent CB, DFC, AFC. After arranging for LF363 to be made airworthy, Stanley Vincent himself led the Battle of Britain flypast over London in the aircraft in September 1949. Between 1949 and 1956, LF363 was held and maintained, rather unofficially, by a series of front-line squadrons and Station Flights, being flown on ceremonial occasions and appearing in various films. After a major re-fit at Hawkers, LF363 became a founding aircraft of the Historic Aircraft Flight, the forerunner of the BBMF, when it was formed in 1957.